This week, my class will be working on spelling words with the suffixes ful, less, and ness. They love playing SyllabiKicks, so I made another set of the game for this week, to help us expand upon the words in our spelling list. If you would like a free copy of this game, please leave a comment below with your email address…I will send a copy of this game to the first three readers to leave their information. 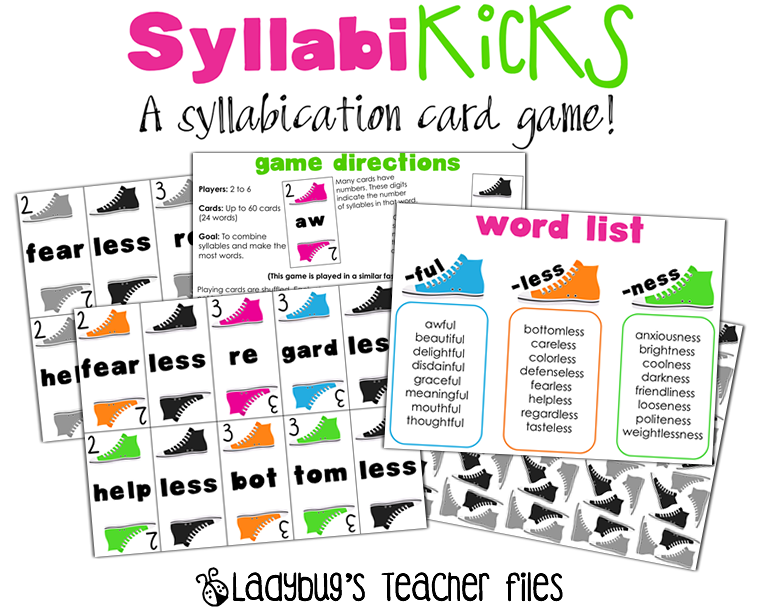 If you would like to see more about this game and the other versions of SyllabiKicks, please check them out in my Teacher’s Notebook shop. This is earlier than I usually post because I’m going to stop by again later and share a free game I am finishing up for my students right now. I hope you will have a chance to stop by and check it out this evening. Thanks for visiting! Love your activities! Thank you! Love the game….sad I missed it. Awe man!! I am never fast enough!! Looks great as always Kristen! I love your Syllabikicks games! They are so cute. I love the sneakers clip art. Have a good week! It's too bad I missed this earlier, but I still wanted to let you know that I bought the -sion/-tion and -el. -al, -le games for my 5th/6th ELD class and my kids love them! I'm looking forward to this new game too. Thanks! It definitely gets the kids more motivated to start looking for these words! Would love to have this game! On Friday I was just trained in Syllasearch and your activity would be great for additional reinforcement! Thanks!